If you’re thinking of taking a mobile app to market, one essential thing to consider is this: how quickly does your app give value back to your end user? By that I mean, do people get something out of the app quickly? And by quickly, I’m thinking within seconds or minutes of use, not hours or days. The quicker your app gives some value, the more likely your users are to remain engaged. The more engaged they are, the more likely they’ll return to your app. In turn, fewer users will give up on your app, and so you’ll see a faster-growing user base because existing users stick around. Financially, you’ll get more bang for each buck spent advertising. In other words, your acquisition costs will be lower. Note: for those making enterprise apps for company employees, you’re probably more interested in helping them be more efficient. In this case, giving value to them quickly will translate to people using the app more, which in turn will help you get the efficiency savings you set out to achieve. At the same time, you’ll spend less time having to “encourage” teams to adopt the app, which is a common management challenge that can also lead to hindered progress. Instagram – As soon as you apply a filter to your first photo, you’ve got a nicer looking photo. As this sketch shows, for apps such as Instagram there are several places where value is felt by the user in a short timeframe. It may sound dramatic, but if your app idea doesn’t give some instant gratification, you should consider it a potential warning sign. Of course, not all apps are geared up for instant gratification. Instead, your app might need people to wait a little time before they get something from it. Uber and Deliveroo have this problem, and there are ways around it. 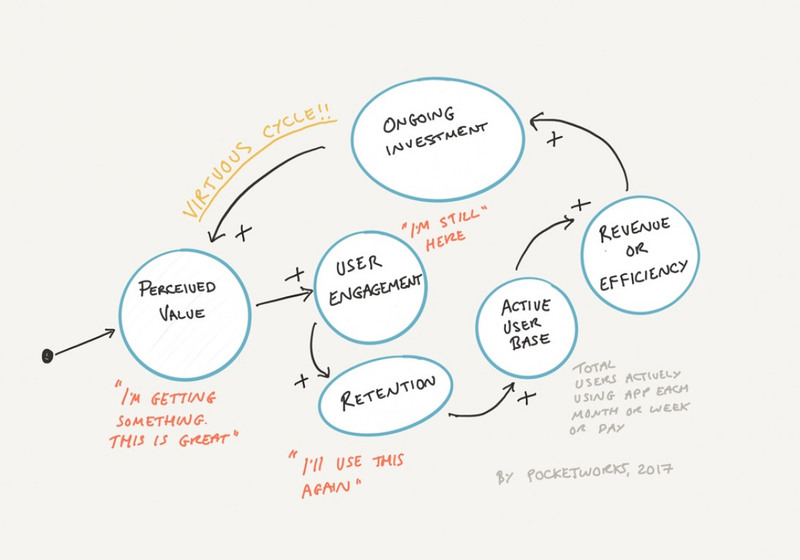 If your app is more of a “slow burn” when it comes to giving value to users, it’s worth exploring how to inject a little instant gratification in there. This will help keep users engaged and encourage them to come back repeatedly. Uber – As soon as you book a taxi, you can immediately see it coming to pick you up. Some of these techniques might seem obvious, but I’d bet 50p that the teams designing these apps made conscious decisions to invest in app features that keep users engaged and happy whilst the true value was “in the post”. If you’re looking for inspiration, here are some ways you could consider giving instant gratification. Sometimes it’s possible to give secondary forms of value to keep people engaged. This is what Uber, Dominos and DropBox do when they’re showing you a car on the map, or a preview of a document. Sometimes you can’t avoid making people wait. For example, it would be silly for Uber to try and keep cusotmers in the app whilst the cab is on its way. So instead they send emails and push notifications to draw them back in. RunKeeper sends weekly reports to remind runners of their goals and progress. So, if your users mustwait, consider similar approaches to out-of-app engagement. Encourage users not to give up whilst they wait to receive value from your app. You could show a progress indicator so they know they are getting there. Or use gamification to give them “points” that reward positive behaviours. The worst case scenario is that you simply need to entertain people whilst they’re waiting. You could consider giving them some hints and tips so they’re learning whilst they’re waiting. Some apps give people a quick game to play whilst people wait (not a fan of this). You can also offer more moments of delight where the app surprises the user with something interesting and fun. In summary, it’s worth considering how to give some instant gratification. If it doesn’t suit your product, consider finding ways to show progress or delight the user to keep them entertained and engaged. User retention in apps is hugely important. Acquiring users can be expensive, so losing them is wasting that investment. And, there’s more to it than acquisition costs. You’re also significantly lowering the lifetime value of users, which means you’re missing out on increased revenues or efficiency savings. If you’re building an app to facilitate a transaction, such as a taxi booking app, consider finding intermediate forms of value around the transaction. This might be showing progress, or allowing users to get the job done more quickly. If you’re building an app to increase staff efficiency, consider finding other forms of value. For example, consider an app that helps the sales team present current and consistent sales information to clients. This could also give sales staff an insight into new and popular materials for their division, so it becomes and educational tool that helps them do their job better. Pocketworks exists to help businesses build modern digital solutions that actually work; which bring long term success and help them achieve business growth. Our expertise spans mobile apps, cloud solutions, IoT, enterprise apps, big data and chat bots. Engagement and retention are one crucial component of your app’s success. Each day, we’re helping startups and established businesses take ideas to market safely. We help businesses solve many types of problem relating to manufacturing, enterprise efficiency, mobile booking, delivery and retail.